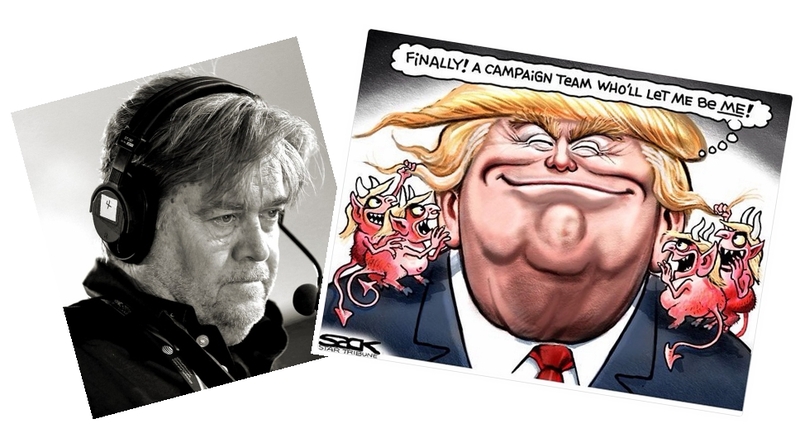 Stephen Bannon, the head of Breitbart News, The new chief executive officer of Donald Trump's presidential campaign. BloombergPolitics describes him as "This Man Is the Most Dangerous Political Operative in America." Just when you would think it could not get any worse for the transgender community from the Republican Party and political right, look at what Steve Bannon, Donald Trump’s new Chief Executive offices said on his blog Breitbart. Headline – “Big Trans Hate Machine Targets Pitching Great Curt Schilling” Former Boston Red Sox great Curt Schilling says that men are men and women are women. That may cost him his job on ESPN. Bannon is the executive chairman of Breitbart News, the crusading right-wing populist website that’s a lineal descendant of the Drudge Report (its late founder, Andrew Breitbart, spent years apprenticing with Matt Drudge) and a haven for people who think Fox News is too polite and restrained. Further, Vanity Fair’s Hive had this comment on what appear to be Trump’s master plan: "Bannon, not surprisingly, has critics, even within the movement he leads. A former employee of Breitbart described him as “Donald Trump but more intelligent.” He didn’t mean it as a compliment, and was instead referring to the opportunism, the personal vindictiveness, and the lack of a moral center that have become defining characteristics of Trump." Be worried - Now is not the time to do nothing or be politically inert. I do not think I am a person that would believe anything without research and what I wrote is not about Hillary. This was about the political Republican agenda against the transgender community. It is in black and white in Republican policy papers, and the party platform. Trump’s chosen running mate has spoken out publicly against public schools allowing trans students to use the bathroom that best corresponds with their gender identity. Based on the choice of Mr. Trump’s new advisors and his VP, I am troubled. I would be happy to entertain an opposite view. Feel free to comment any time. First Space of all Rhonda thanks for doing your blog. I come here daily for ideas, inspiration and to pick me up. And I don't think this election is about whether Clinton or Trump are honest. They are both politicians and therefore their honesty open either is suspect. However it is clear that if you are Trans, gay, lesbian or in some other way marginalized in our society then the Democrats offer more hope and the Republicans under Trump more to fear.